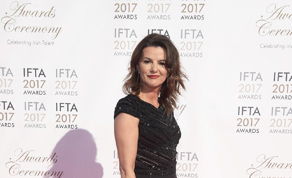 The annual IFTA Film & Drama Awards, which for the second time was hosted by actress and comedienne Deirdre O’Kane, crowned A Date for Mad Mary with the title of Best Film. Cast member Charleigh Bailey also took home the IFTA for Best Supporting Actress Film and was presented her Award by Irish actor James Nesbitt. The Award for Best Drama went to historical drama 'Vikings' with Dee Corcoran and Tom McInerny also taking the statuette for Best Make-Up & Hair on the series. The full awards ceremony will air on RTÉ One Tuesday, April 11th at 22:15. Colm Meaney received the IFTA for Best Lead Actor Film for his portrayal of the late Martin McGuinness in Nick Hamm’s The Journey. The Award was presented by Fionnula Flanagan. Three Awards went to Richie Smyth’s debut feature The Siege of Jadotville, with Smyth accepting the award for Best Director Film and Jason O’Mara receiving Best Supporting Actor Film. The film also won for VFX (Windmill Lane VFX). Best Lead Actress in Film was awarded to Loving star Ruth Negga. The prestigious George Morrison Feature Documentary Award went to Dave Clarke and Ciarán Deeney, the team behind Colm Quinn’s Mattress Men. Best Short Film went to Dave Tynan for viral project Heartbreak while Animated Short went to IADT graduate Vincent Gallagher for stop motion project Second to None. Rising Star Nominee Peter Foott was awarded for Best Script in Film for The Young Offenders'. The Rising Star award sponsored by the Irish Film Board went to The OA and Property of the State actor Patrick Gibson, who accepted his award from Bleed for This actor Ciarán Hinds. Highlights for drama categories are led by Vikings team Morgan O'Sullivan & James Flynn accepting the coveted title of Best Drama, with an additional award for Best Make-Up & Hair for Dee Corcoran & Tom McInerney on the History Channel series shot in Co. Wicklow, Ireland. Best Lead Actor in Drama this year goes to Cillian Murphy for Peaky Blinders with Amy Huberman taking the Best Lead Actress in Drama for new homegrown series Striking Out which was presented by Stephen Rea. Another flagship achievement in original Irish drama is James Phelan’s award for Best Script Drama for Centenary comedy Wrecking the Rising. Supporting acting talent in drama sees Charlie Murphy honoured for Happy Valley and Ned Dennehy for Irish language western series An Klondike. Consolata Boyle of Florence Foster Jenkins achieved the award for Best Costume Design for this, her sixth award of a total nine Irish Academy nominations to date. Seamus McGarvey came out on top of the Director of Photography category for his work on Tom Ford’s Nocturnal Animals, and Nick Emerson for Best Editing on Billy O’Brien’s I Am Not A Serial Killer. The Secret Scripture took double craft awards with Derek Wallace awarded the IFTA for Best Production Design and Brian Byrne taking the award for Best Original Music. The Siege of Jadotville took home its third award for Best VFX, which went to Tim Chauncey of Windmill Lane VFX. Juanita Wilson’s second feature Tomato Red earned the award for Best Sound tonight, for the work of Niall Brady, Ken Galvin & Steve Fanagan. Best International Film was Moonlight; Best International Actor Casey Affleck for Manchester by the Sea, Best International Actress was Emma Stone, for La La Land.